Lose That Girl: HATE IT! No Makeup Means No Story! I love the UK media -- just love it! Throughout my day, I continually check in with my favourite websites, some newsy, some pure trashy tabloid. The British press are notorious for making up sensational crap as well as taking the smallest, most unimportant crumb of fluff and blowing it up into the supposed scoop of the day. In my travels today I stumbled over the latter, *this* non-story. 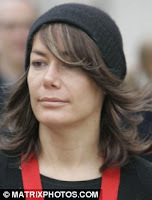 Tara Palmer-Tomkinson, friend of the Royals, rich party girl with a fondness for designer labels and a life of luxury, happened to venture outside for a shopping trip in London -- without makeup. The story found on the Daily Mail website is aghast at her bravery for making the public trek without pounds of slap affixed to her 37 year old visage. Personally, I think Tara looks fresh-faced fantastic! She should be proud of how terrific she looks, and the press here have totally missed the mark. The article seems to think that she's gained weight (shock! horror! ), traded in her couture for run of the mill threads and become... normal. Heaven forbid. Is it really any wonder why some women have a distorted sense of what they should present themselves to the world when a popular "news" source freaks out when a well-known gal about town leaves the makeup bag at home, unused? Stereotypical stupidity on the part of the Mail or slow news day? Sorry but I think their attempt at taking a swipe at Tara P-T failed big time. They should be knocked back for airing their biased opinion that a woman wearing no makeup is shocking and horrible. She looks great - period! The Daily Mail -- now that's ugly! She looks normal for once. The DM like to put all sorts of crap in the paper. I love it though; it makes me laugh. Most of the rubbish that they think is serious is hilarious to 'normal people'. They called Gemma Arterton 'jowly' because they have an absession with stick think people. Then they called Lindsay Lohan for being too thin. I love the Daily Mail, its hilarious without even trying. The comment sections are fantastic for a laugh too as all arguments seem to come back to the TV licence. She looks perfectly fine without makeup! I don't see what their big deal is.